Hardtack (also known as hard tack, hard-tack, ship’s biscuit, and sea bread) is a simple, inexpensive, cracker or biscuit that’s primarily made from flour, water, and salt. It was originally used during long sea voyages, overland travel, and military campaigns where perishable foods would spoil. Hardtack is still a staple food in some parts of Canada where it’s produced commercially. In America, hardtack is most famous for its extensive use by both sides in the Civil War, but it is still eaten extensively in Alaska. Hardtack makes up much of the required survival food on flights in Alaska. Many villages still stock hardtack as well even though other shelf-stable foods are available. 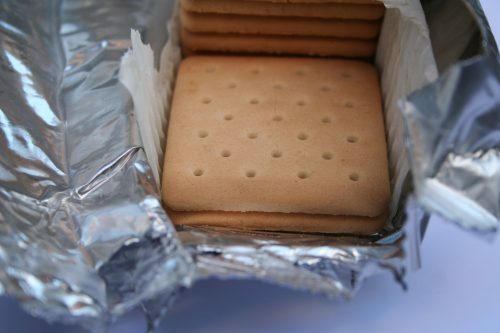 Manufactured hardtack is also an inexpensive long term food storage item for preppers. There are a number of long life foods available but hardtack is cheap and versatile. Hardtack has had a whole host of horrible names in the past but this simple survival food opened the door for worldwide exploration and massive military campaigns. In this article, we’re primarily going to focus on how to make hardtack . If you like history, you should take a couple minutes to read more about hardtack as it’s really interesting. If you’re interested in other homemade survival foods, make sure you read our Pemmican article before you go! In order to make hardtack that can last for years, follow these simple instructions. You can add more ingredients to make your hardtack taste better, but just keep in mind that they will reduce the shelf life. Sugar, fats, and spices have all been added as a way to make hardtack taste better. Our first recipe for hardtack will have the longest shelf life and is the best for long-term storage. The other hardtack recipes will taste better but will have shortened storage lives. They’re best made for shorter outings where the longevity of the hardtack isn’t as critical. Keep your hardtack dry in order to preserve its shelf life. The steps to make hardtack are very simple. Mix all ingredients until you have a stiff dough. Start with 1/2 cup of water and only add more if needed to complete your dough. Spread out on a baking sheet to roughly 1/4 inch. Poke holes in your rolled out hard-tack dough and cut into roughly 3″ squares. Bake in a preheated oven at 350 degrees. Cook for 1-hour checking to make sure they do not burn. Remove them from the oven, flip over and cook for another 30 minutes. The hardtack is complete when it is brown (not burned) on both sides and rock hard. If your hardtack isn’t hard enough you can place it back in the oven until it is appropriately hard. Store the completed hardtack in an airtight container for best results. 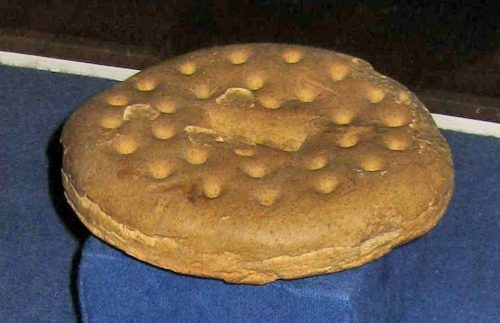 This version of hardtack was used primarily by American settlers moving from the East into the Western plains. This hardtack recipe requires more ingredients but is just as simple to make. Roll the dough into a ball and sprinkle with flour. Roll out the dough as thin as you can. Once it is rolled out you can sprinkle it with salt to add flavor. Poke holes in your rolled out dough and cut into roughly 3″ squares. Place the dough onto a greased cookie sheet and cook until the edges are brown. Flip over and put the hardtack back into the oven until it is dry and lightly browned across the top. Cool your fully cooked hardtack on a cooling rack and store in an airtight container. 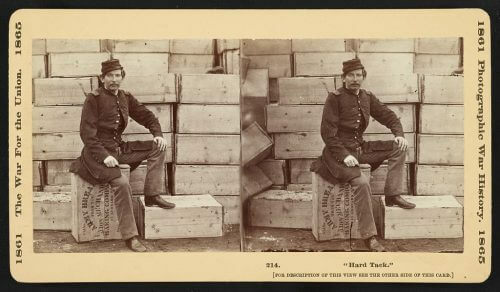 This Confederate Soldier Hardtack recipe is rumored to have been made by Southern soldiers during the Civil War. Roll the dough into 8 evenly sized balls and flatten to roughly 1/4 inch. Bake the dough at 350 degrees on a greased cookie sheet until they turn golden brown. For a longer shelf life, flip the hardtack and bake until the top is evenly browned. This style of hardtack is going to have the shortest shelf life but it also tastes the best. Hardtack was often ground up and added to soups and stews as a thickener. This makes the hardtack more palatable for some people. Almost any kind of spread that you would normally put on bread goes well on hardtack. Peanut butter, jellies and jams, honey, and applesauce are all commonly spread on hardtack. If you’ve made an especially hard batch of hardtack (typically good for very long-term storage) then softening the hardtack in water or coffee is recommended so it’s easier to chew and not as hard on the teeth. 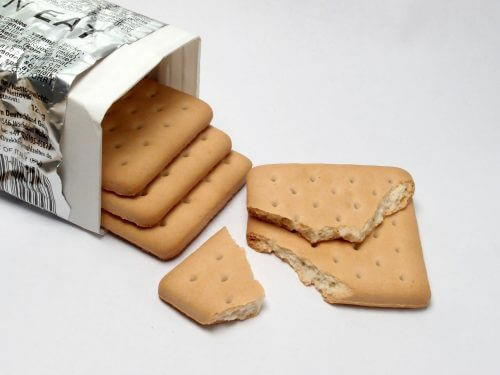 Hardtack gets it’s long shelf life by not containing ingredients that spoil and containing as little water as possible. As you add ingredients or make softer hardtack, you’re going to drastically decrease this shelf life. These are by no means the only hardtack recipes out there. Experiment with what you have and see what you can come up with. In fact, you can make hardtack by simply mixing water and flour together! It may not taste good but it has calories and stores for a long time. Do you have experience making hardtack that you’d like to share? Let us know in the comments below.